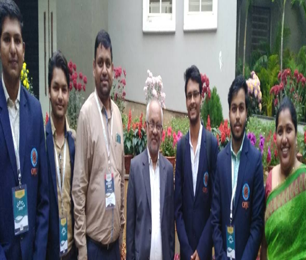 OPJU students participated in the final round in ESVC and was awarded the Spirit of ESVC, 2019. We congratulate the students and are proud of this achievement who have kept the flag of OPJU flying high. 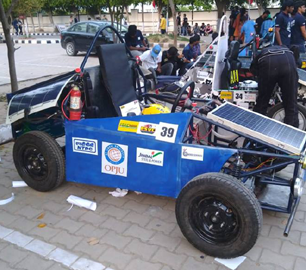 A team of 20 students, under the able guidance of Prof. Pradeep Singh Chauhan & Prof. L R Bhandarkar participated in Asia’s biggest Electric Solar Vehicle Championship. OP Jindal University is the first University of Chhattisgarh, participated in this Championship. The championship was started in year 2013, with an aim to create awareness among future engineers about renewable energy, resources and its uses. This championship is being sponsored by Chattisgarh State Renewable Energy Development Agency (CREDA), Solar Energy Society of India (SESI), Sunmobility, Fronius India Pvt Ltd, Edmont (Noida), Kaho Solar, Nalwa Steel & Power Ltd, and other JSPL Group companies and many more. 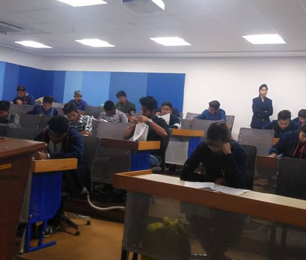 Department of Mechanical Engineering, School of Engineering, O P Jindal University (OPJU) organized One-Week Training on ANSYS Software in association with Tool Room & Training Centre (TRTC), Patna (extension Centre of Indo Danish Tool Room (IDTR)), Jamshedpur during March 11-16, 2019. ANSYS software allows engineers to construct computer models of structures, machine components or systems; apply operating loads and other design criteria; and study physical responses, such as stress levels, temperature distributions, pressure, etc. Students also got an opportunity to learn about its implications in various field of engineering. The ANSYS program has a variety of design analysis applications, ranging from such everyday items as dishwashers, cookware, automobiles, running shoes and beverage cans to such highly sophisticated systems as aircraft, nuclear reactor containment buildings, bridges, farm machinery, X-ray equipment and orbiting satellites. The Metallurgical and Materials Engineering (MME) department organized the Guest Lecture. 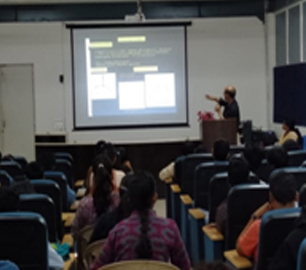 The speaker Dr Neha Gupta, Assistant Professor from National Institute of Technology (NIT), Raipur delivered the lecture on the topics Metal foams& Meta Materials.The students were made familiar with the structure, properties and applications of metal foams in various fields. On the other hand, an overview regarding metamaterials was also given to the students. OPJU congratulates Mr. B Bhede, Phd Research Scholar, Mech. 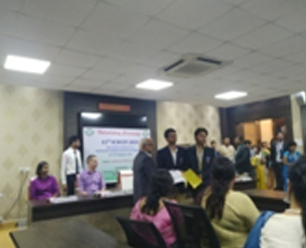 Engineering department for presenting a paper titled “Review and Performance Investigation of Thermally Activated Rotary Desiccant Wheel Dehumidifier” co-authored by Dr S S Chakrabarti and Dr. U S Wankhede at “12th International Conference on Thermal Engineering: Theory and Applications”. 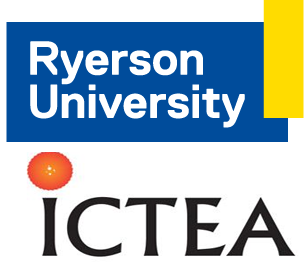 The conference was sponsored by Pandit Deendayal Petroleum University, Gandhinagar, Gujrat in collaboration with Ryerson University, Toronto, Canada. An educational tour for Diploma students from Govt Polytechnic College Raipur, Govt Polytechnic Bilaspur& KGP Raigarh was organized at OP Jindal University Raigarh on 18 th -19 th February 2019. More than 150+ students & 10 faculty members of various streams - civil, electrical, mechanical computer science participated in the educational tour. Various recreational activities like bonfire, passing the ball, balloon game, musical chair, sports etc. 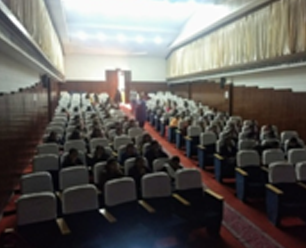 were organized followed by workshop related to their respective subject latest technology to upgrade their technical skills along with professional development. OP Jindal University provided an excellent opportunity to the Students and teachers to be together outside the classroom environment, giving them a practical exposure to the University life. The visitors mentioned that they observed many things that are not available at their colleges, including latest technologies, rare plants, live industry projects, real time machines &equipment in the Jindal Steel & Power, Jindal Power Ltd, SSD & other subsidiaries of Jindal Group as a part of their industrial visit to these plants. It will be worthwhile to mention the support from OPJU’s School of Engineering faculty, staff & admin department who worked day and night to make this trip successful. 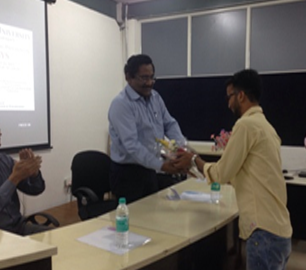 Department of Mathematics organized a guest lecture by Prof. S. Chakraverty from Department of Mathematics, National Institute of Technology Rourkela on “Eigen Value Problem and its Applications in Engineering” as well as on “Artificial Intelligence and its Applications”. The lecture was divided into two sessions. First session was on "Eigen Value Problem and its Applications in Engineering" were students of First & Second year were taught about the importance of dynamic analysis of structures, population problems, biomathematics, image processing spectral clustering and the google page rank algorithm etc. Prof. S. Chakraverty also taught various methods to find Eigen value and Eigen vector. He also solved few engineering application problems. The second session was on "Artificial Intelligence and its Applications" for B-tech first & second year CSE & CIVIL students. He first started his lecture discussing about the basic definitions of Fuzzy Set Theory. He showed various research work related to fuzzy differential equation and Fuzzy Eigen value problems. Then he taught about Artificial Neural Network. He gave the students an idea about the applications of Hybrid Neural Network in the field of Structural Engineering which was very much helpful for civil students. 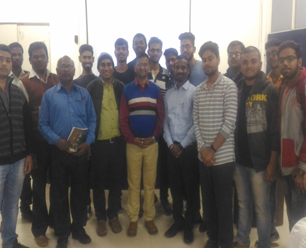 The Department of Mechanical Engineering (School of Engineering), OP Jindal University, Raigarh and Central Institute of Plastics Engineering & Technology (CIPET), Raipur, jointly organised a five-day Certificate Course on “CNC Machining Techniques” during February 05-09, 2019 at OPJU Campus. The faculty members of OPJU and other institutions along with 65 student participants from various polytechnics and diploma colleges studying Mechanical Engineering participated in the training programme. 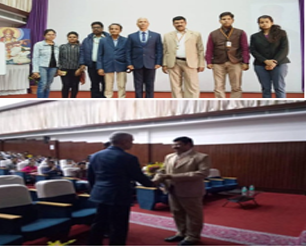 OP Jindal University participated as University partner in 3 days CII Learning and Skill expo held in New Delhi from 3rd – 5th February 2019 attended by Dr. R.D. Patidar, officiating VC, OPJU & Prof J.R. Nair, Director CSO, OPJU. Considering the vital role the logistics industry plays in growth of the country, Confederation of Indian Industry (CII), has been organising an exclusive event on logistics since the year 1997. The 10th edition of "Logistics 2019" - India's Premier and focused show offering end to end solutions in the Logistics Industry is scheduled from 3 - 5 February 2019, at Pragati Maidan, New Delhi. Key highlights of the Expo were gathering of India’s finest Higher Education Universities, Colleges & Schools, psychometric test for students/career counselling, S.T.E.A.M Education by Robots/Virtual Reality & App Development, Workshop on Apprenticeship connect, Futuristic initiatives in learning and skill development across sectors and many more. 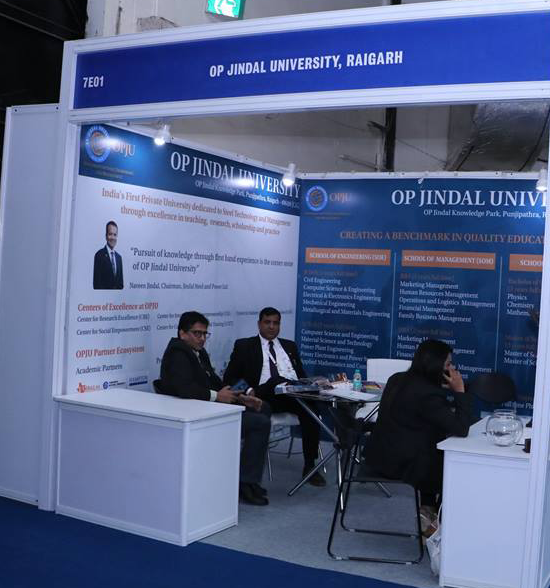 Over all OP Jindal University had a great experience at Learning & Skill Expo in New Delhi. An awareness program for girls as well as for female staff members on Prevention, Prohibition and redressal of sexual harassment at work place was conducted on 29th Jan' 2019. The primary objective of the program was to create awareness among the students about sexual harassment, its type and measures to stop sexual harassment at work place or anywhere. The session was conducted by Ms. Saumya Singh, member of Internal Complaint Committee (ICC), OPJU.The session was attended by all the girls and female staff of OPJU. Overall the session went very well and ended with a series of question and answers. We would like to thank Ms. Saumya Singh for bringing this issue to light. 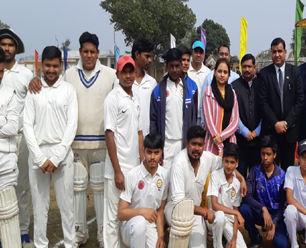 O P Jindal Memorial Duce Ball Cricket Tournament -2019 (All India Tournament) organized by District Cricket Association, Raigarh at, Gharghoda Cricket Stadium on 28th January, 2019. The Tournament was Inaugurated by Chief Guest of the function Respected Dr R D Patidar , Pro- Vice Chancellor , O P Jindal University . This is the 34th consecutive year of this grand tournament and expected 19 Ranji players from 5 states will participate in this tournament. As part of their Wednesday activity, students viz, Saptarshi Manna- 6th sem, MECH, Rahul Jaiswal- 8th sem, EEE, AnshuRanjan- 6th sem, EEE, Saurabhkumar- 6th sem, EEE, Mayank- 4th sem, EEE,Soumit Mandal- 4th sem, EEE, Soubheek- 4th sem, EEE,Surjeet Soni- 6th sem, CSE, held grooming session on 25th January, 2019. The objective of the session was to make 1st year students familiar with the basics of Robotics, IOT & Artificial Intelligence. The freshers also gained knowledge about Arduino and Robotics with model demonstration, latest technology advancements prevailing in the world. The students were also taught about the skills required for their internship and placements in the coming years. This session will help the students to choose the right career path in future. The session ended with series of questions and answers. The event, organized by FICCI, Mumbai was held from 22nd - 24th January. 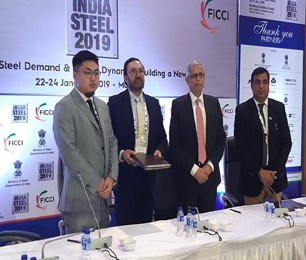 OPJU, Research and Innovation partner of the event signed MOU with Fronius India and along with JSPL signs MOU with Sinosteel and AHUT University, China in the presence of Secretary, Ministry of Steel - Mr. Binoy Kumar at Mumbai Exhibition Centre, Goregaon, Mumbai. An Advanced Centre of Excellence in Welding will be established at OPJU with the assistance of Fronius, world leader in Welding technology. AHUT and Sino Steel committed to offer dual degree programs in Bachelor's, Master’s and PhD level at their campuses in India and China. The students will get an exposure and will specialize themselves with the concept and manufacturing of steel in China. The School of Management organized aMBAtion-2019 – an activity packed Learning Workshop on 19th and 20th January’ 2019 for the final year graduation students of various colleges. The workshop was organized with an aim to educate and empower the students throughvarious trends in management for learning and career development. The management games, sports, workshops on Digital marketing and Industrial tour were the part of this 2-day workshop. In the inaugural event, 38 students participated in the workshop from various colleges in Rourkela and Balangir. Faculty, School of Management, managed the event with the active support from the admission team. Department of Civil Engineering organized one-week workshop on Microsoft Project for 6th & 8th semester students, from 17th – 23rd January, 2019, under the guidance of Ms. Mridula Garg, Lecturer, Civil Department. MSP is Microsoft Project Management software, which is used for planning and developing a project in more efficient way. The objective of the workshop was to make the students familiar with MSP, its uses & properties. The workshop was initiated by Ms. Mridula Garg, Lecturer, Civil department for the students of 6th& 8th semester, Civil branch. The huge number of questions from the students was indeed impressive. The workshop went off very well and was appreciated by all. O.P.Jindal University, School of Engineering, Department of Mechanical Engineering has organized an expert talk on" 3D printing/additive manufacturing” By Mr. J Aatish Rao From Tech Mantra, Vijaypur Karnataka for the 4th and 6th-semester mechanical students on 14th January 2019 from 2.00 PM to 5.00 PM at Seminar Hall. The Objectives of the expert talk is to create awareness about the 3D printing/additive manufacturing to the students. To explore the future scope and job opportunities in this area of CAD/CAM/CAE/Additive manufacturing to the students of the University. The University has already created a University Makers Space/ FAB Lab where 3-D Printers will play a major role. 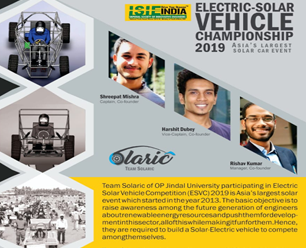 OP Jindal University has been selected for the final round in ELECTRIC SOLAR VEHICLE CHAMPIONSHIP, 2019, to be held in April, 2019. Electric Solar vehicle championship is the Asia’s biggest solar event aimed at making a new generation Solar Electric Vehicle. A team of 20 students, under the guidance of Prof. Pradeep Singh Chauhan & Prof. L R Bhandarkar participated in Asia’s biggest Electric Solar Vehicle Championship. OP Jindal University is the first University of Chhattisgarh, participating in this Championship. The championship was started in year 2013, with an aim to create awareness among future engineers about renewable energy, resources and its uses. This championship is being sponsored by Chattisgarh State Renewable Energy Development Agency (CREDA), Solar Energy Society of India (SESI), Sunmobility, Fronius India Pvt Ltd, Nalwa Steel & Power Ltd, and other JSPL Group companies and many more. 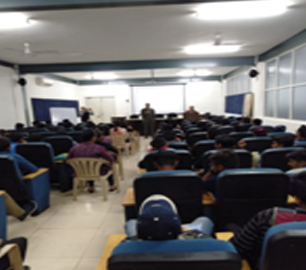 OP Jindal University organized a guest lecture on "Inspirational leadership" on 11 January 2019 delivered by Major General Sanjay C. Meston. SM, VSM (Retd). 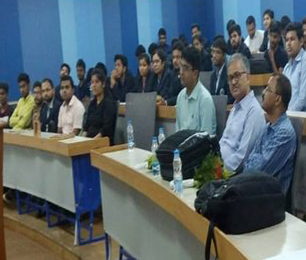 The session was attended by both the students as well as faculty members of OPJU. General Meston shared many experiences and valuable leadership lessons primarily from his long and illustrious career in the Indian army. General Mestonpointed out how Inspirational leadership can create a sense of direction as well as energizes individuals to strive towards a compelling future. It was a great learning opportunity for the students and faculty ofSchool of Management and School of Engineering. We thank Major General Sanjay C. Meston for sparing his valuable time for us. School of Engineering, Civil Engg. Branch organized an Industrial tour to CSIR - STRUCTURAL ENGINEERING RESEARCH CENTRE, Taramani, CHENNAI on Monday 7th January, 2019. The objective of the tour was to make student-teachers to learn and get acquainted with complete knowledge of advance testing procedures and working of instruments such as shake table operation for simulating earthquake force, wind tunnels for applying wind load, strain gauges involved in health monitoring of building and special constructions techniques involved in. We would like to show our sincere gratitude to Dr.N.G.Baghavan, Senior Principal Scientist, CSIR-SERC Chennai for giving permission to visit the STRUCTURAL ENGINEERING RESEARCH CENTRE and Mr. Ramkrishnan, for guiding the students during the visit at center.